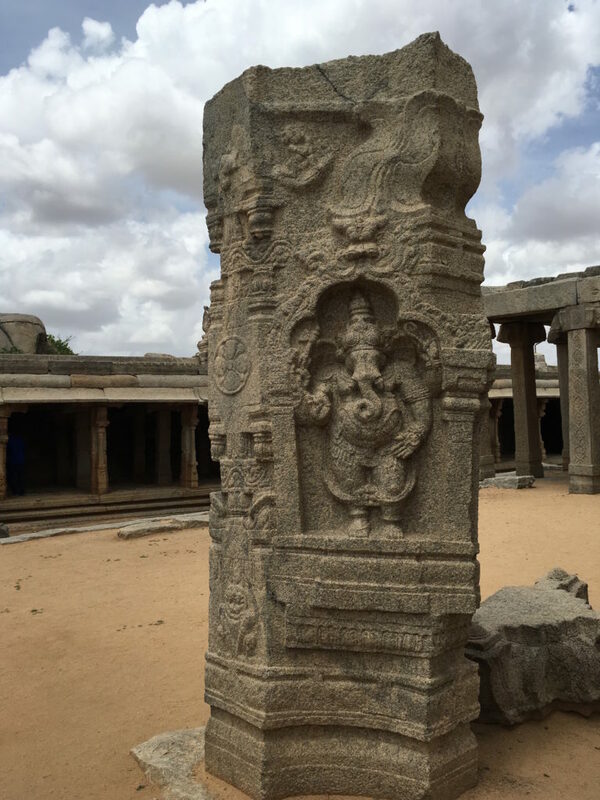 As the legend goes, Lepakshi - the Vijaynagar era temple, is the place where Jatayu, the vulture, fell wounded while trying to save Sita from the clutches of the demon king, Ravana. 'Le-pakshi' in Telegu means: 'Rise - O - bird'. These were the words which Lord Rama uttered on seeing Jatayu injured in that condition. This legend is surely fascinating and so is the temple architecture and its murals. 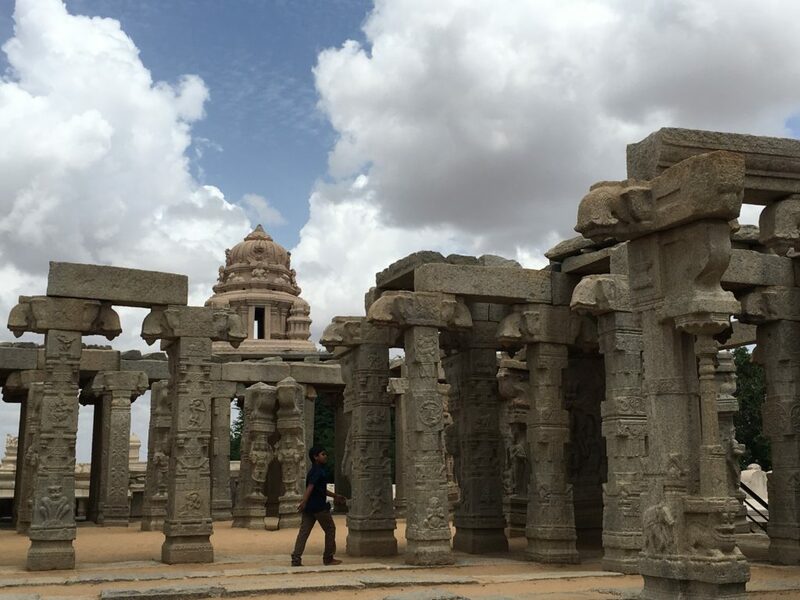 The 16th century temple is situated in the Anantapur district of Andhra Pradesh, some 120 kms north of Bangalore. 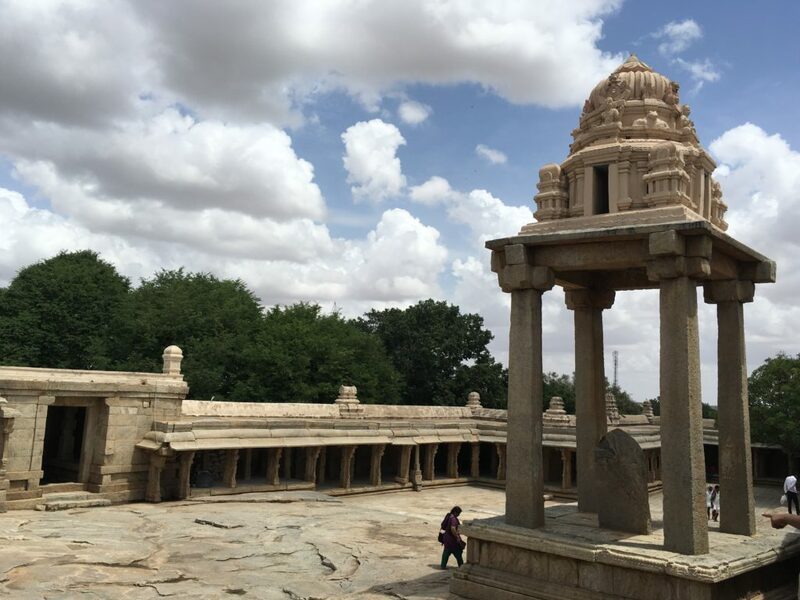 Dedicated to Lord Veerabhadra, Bhadrakali, Vishnu and Lakshmi, this temple is well-known for its hanging pillar and India's largest monolithic granite-sculpted Nandi. 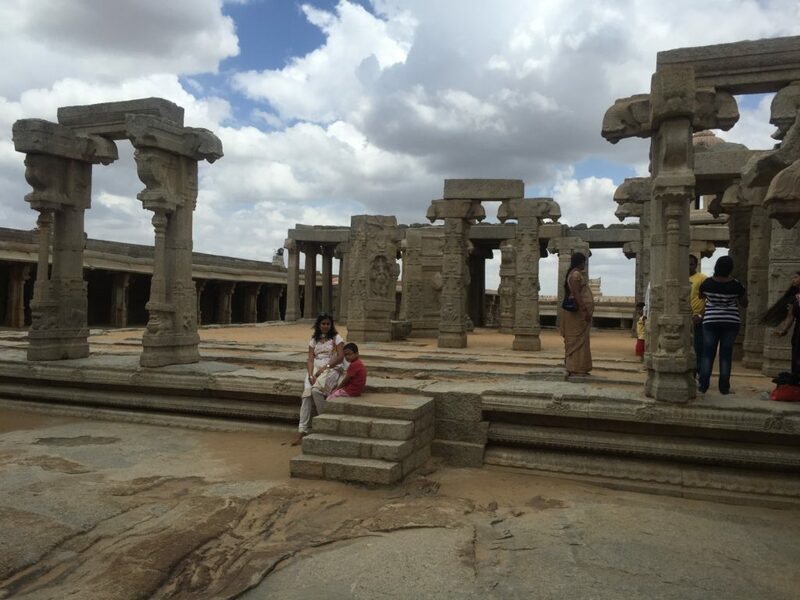 Lepakshi is about an hour-long drive from North Bangalore on the lovely Bangalore-Hyderabad highway (NH44). Cruising at a speed of little more than 100 kmph, we reached Anantpur at about 10 in the morning. Taking cues from the signboards, we turned left off the highway onto Lepakshi Road and passed a few charming villages before being welcomed by the granite monolithic Nandi some 200 metres from the main temple. We parked near the Nandi enclosure next to the APTDC Haritha hotel. As soon as we stepped out of our car, we were greeted by a couple of monkeys and a group of kids, who followed us demanding money. We soon enough realised what they really wanted and bought all of them ice cream from a vendor nearby. The happy faces waved at us as we proceeded on. The Nandi is ornately carved from a single block of granite, with a height of 4.5 m and a length of 8.23 metres, making it the largest monolithic Nandi in India.It is bedecked with bells, earrings, chains and other jewellery and it faces the shiva linga inside the temple premises, some 200 metres away. Another monolithic Nandi, probably the second largest in India (need to verify the fact here), faces the Virupaksha temple from the bazaar lane of Hampi. Interestingly, both these monolithic bulls are the architectural marvels from the bygone Vijaynagar era. We walked over to the temple which is atop a small hillock known as Kurma sailam (tortoise-shaped hill). The sanctum sanctorum houses the main shrine of Veerabhadra (a fearsome form of Shiva), Bhadrakali, Vishnu and Laxmi. The murals on the ceilings are still visible and are partly intact in places with all their colors and forms. Their mere glimpse depicting the everyday way of life then, clothing, social events, musicians, processions, etc. transport us to that glorious, royal past. I desisted from clicking pictures inside the garba griha to do my bit to preserve the remainder of the murals. The murals are fading away and are in urgent need of restoration. Right outside the main temple hall lies the Ranga mantapa or the 100-pillared dance hall with its exquisitely carved pillars. Another interesting aspect of this temple is its hanging pillar which hangs from the ceiling without touching the ground! No, no it not defective. The Archaeological Survey of India had demonstrated that the pillar was not defectively built but was specially constructed this way to highlight the sheer brilliance of the architects of their time. One can easily pass a sheet of cloth or paper from underneath the pillar and verify the truth. To the left of the main shrine, lies the Kalyana mantapa which as per records, was never completed. 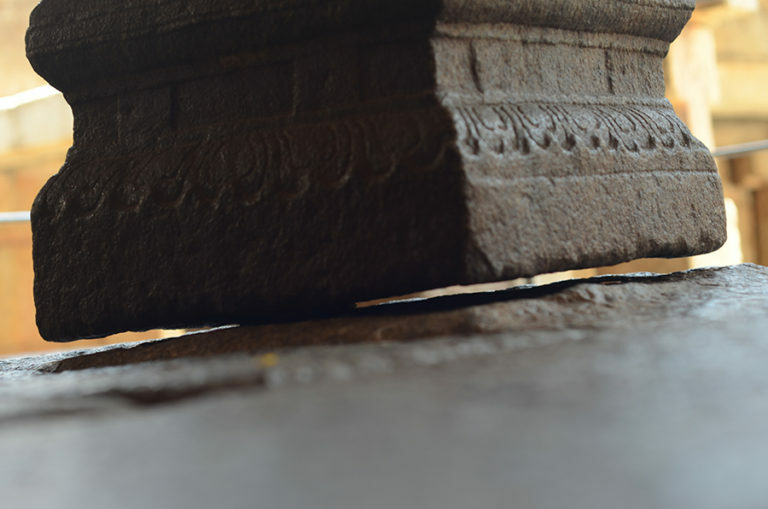 However, the exquisite carvings adorning the pillars of the mantapa leaves one, still, spellbound. Below the elevated Kalyana mantapa is a big, right footprint considered to be Devi Sita's footprint. 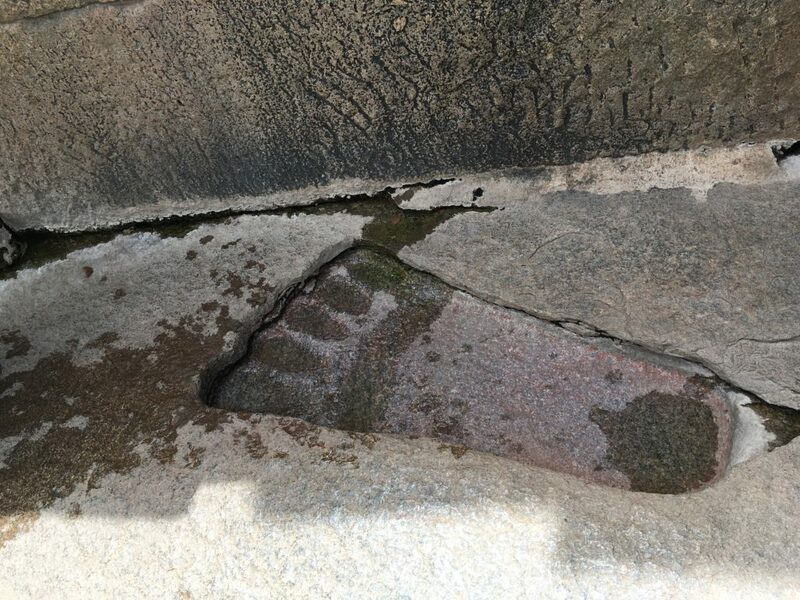 The footprint is always wet with some water seeping in through the rocks. No one knows the source of this water supply nearby. Interesting, right? The brilliance of the architecture manifests itself in every nook and corner of this temple. 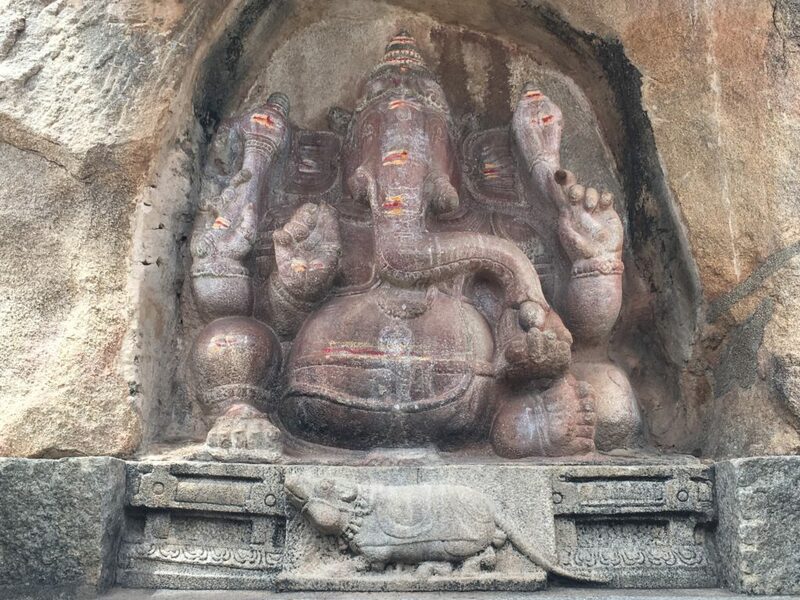 There is a huge Ganesha carved out on the other side of the mantapa. A shivalinga canopied by a hooded, 7-headed naga is another marvel carved on the other side. Legends abound this temple as does the beauty of its carvings. 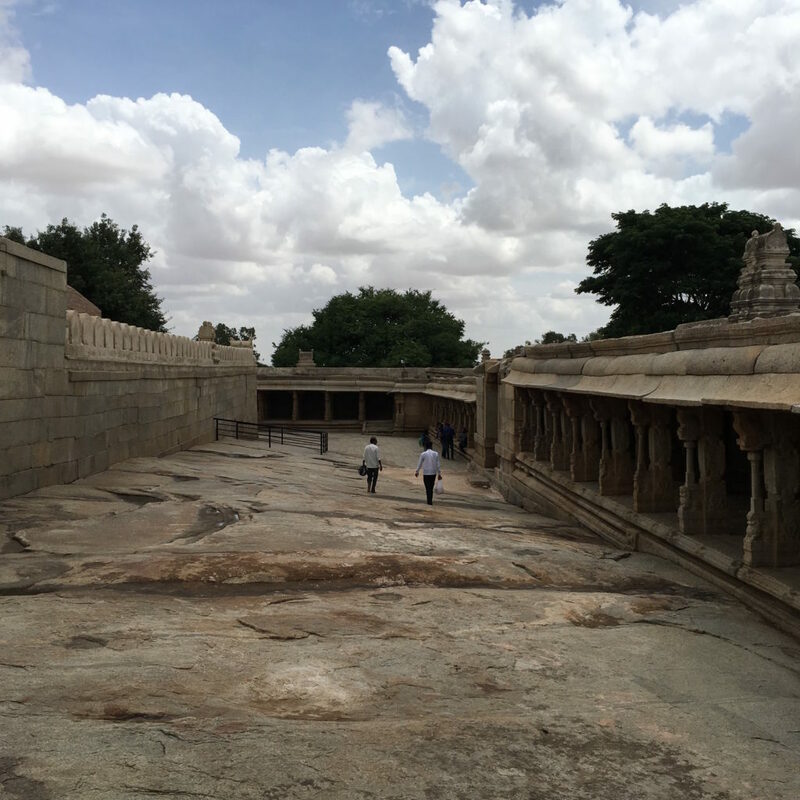 The temple was built by brothers Virupanna and Veeranna during the rule of king Achyutraya of the Vijaynagar empire. It is said that Virupanna, who was a royal treasurer, misappropriated the funds from the royal treasury for the construction of the temple without the approval of the king. The infuriated king, as a punishment, ordered Virupanna to be blinded for his act. When Virupanna heard of the punishment, he himself carried it out by dashing his eyes against the walls of the temple. Even to this day, the two (supposedly) gory blood marks on the temple walls stand a mute testimony to this legend. 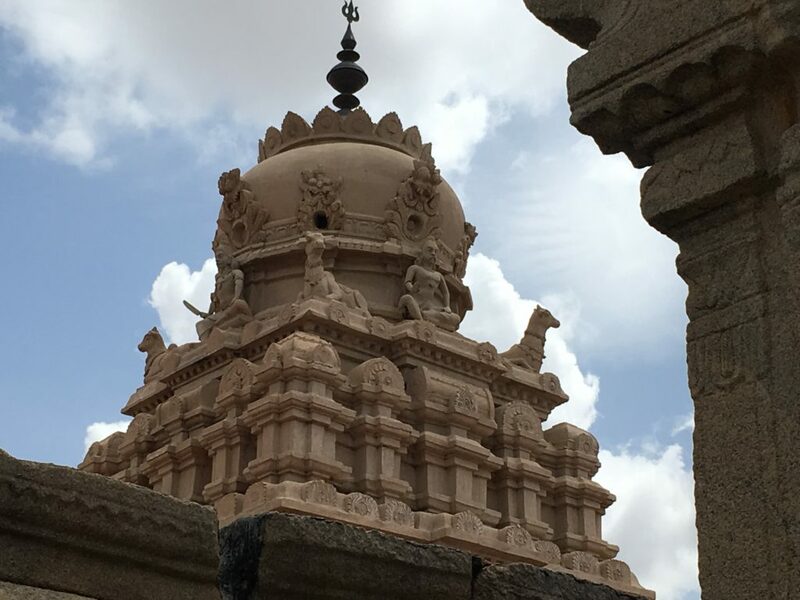 After this incident, the temple construction came to a standstill and the Kalyana mantapa (wedding hall) and other structures remained unfinished. One requires about 2-3 hours to explore the temple and enjoy the carvings. We did not see any guides around in the vicinity in the temple. However, as per other blogs and travel sites, guides are supposedly available to help us get around. 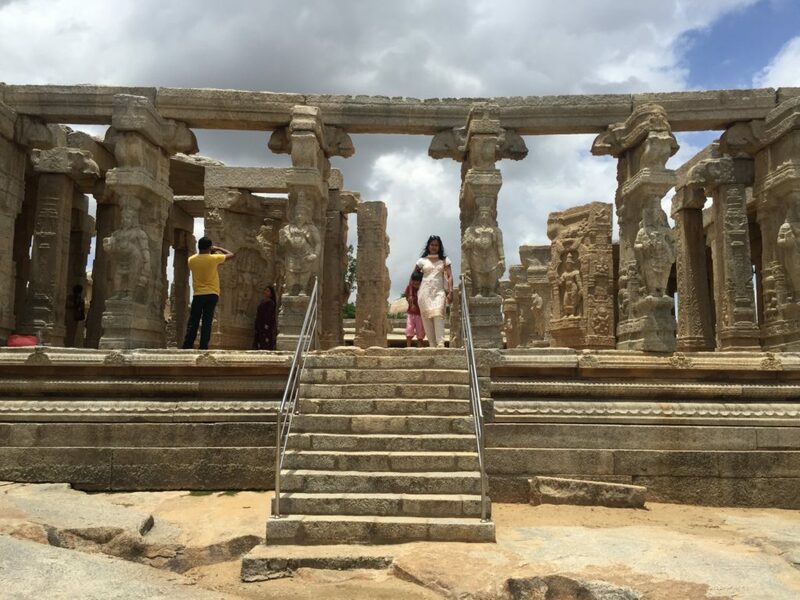 Lepakshi is a half-day trip from Bangalore and an enjoyable one! Not to be missed by the residents of Bangalore for sure. Route: Bangalore North -&gt; Bellary Road -&gt;NH44, towards Hyderabad for about 100 kms. There are a couple of tolls on this road. Take a left diversion as per the signboard in Anantapur district of Hyderabad and drive around 16kms on Lepakshi road to reach the temple. Carry sun protection like hats, sunglasses and skin creams as it gets really hot there, especially during summers. There are no restaurants except APTDC's Haritha in the vicinity. So it is advisable to pack food for your trip there.